The holidays are over and you’ve got a landfill full of wrappings, boxes and tissue to toss…not so fast, you can recycle all of it! My grandmothers never even realized they were saving the earth when they would fold up the wrapping paper (that wasn’t torn to shreds) and save those pretty ribbons. You can reuse many of the items and save yourself mucho dollars in the process! The rest can go into the recycling bin. Well, we are very close to Christmas…are you ready? If you’re having family and friends over for a festive dinner or party, the table has to look as good as the rest of your house. Tablescaping, the art of arranging tables, is one way to add drama to your tabletop. If you want to create a tablescape that wows your guests, vary the heights of the objects you use. For example, you can stack your favorite Christmas books and place a candlestick on top, pair a large urn with two smaller vases, or conceal a sturdy box under layers of luxurious fabrics to add height and sophistication. (That’s similar to what I did, below at right). If you’re not in the mood to layer, just remember, it's all in the details. When you set your table this holiday season, the key is to add something unique to make your table memorable. For example, the photos above and on the left are examples of a very simple centerpiece. I used the inside of an old toolbox and filled it with mini pinecones and candles and then adorned with an articficial pine garland. Other ideas: Serve breadsticks in a tall champagne flute or pretty flower vase instead of placing them on a flat plate or in a basket. Add a sprig of holly or pine on your serving plates for a simple, yet festive look. Sprinkle a decorative seasoning, such as paprika or minced herbs around the edge of each serving piece. Stretch a garland or pine roping the length of your table and add some votives for a very easy, festive look. Sprinkle glitter or confetti around your serving bowls or centerpiece. Dress your chairs with bows, berries and/or branches to complete the look. 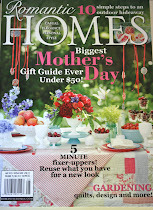 I saw a quick tip on HGTV from designer Taniya Nayak the other day. She took creme pillow cases, placed them on the back of dining room chairs and then tied a big red bow around the back…they looked very festive. Check out HGTV’s website for more ideas…they have tons! The way a table is set can add to the ambience of any meal. The key to setting the table this holiday season is to have fun and use your imagination. Of course, serving delicious food can't hurt. May you have a very blessed and merry Christmas! Do you have any simple ideas for holiday tabletop décor? If anyone knows me well, they know that I like themes – yes, as corny as that may be – I just think themes are fun. The Christmas holiday season can lend itself to many, many themes. Think about it – snowmen, crafty, woodsy, nature, elegant, glitzy, soft, bold, all the shades of red and green and in-between – there’s just a zillion ways to decorate for the holidays. And since I like almost all of them, I decided to decorate each room and even sections of rooms, with different themes by creating vignettes. For example, my family room and connecting kitchen (above) has a more traditional, cozy feel, so my decorations enhance that look, whereas my dining room is a tad more formal, so I embellish it with lots of gold and glitz. Crafting holiday vignettes is easy. Just group things in odd numbers – groups of three or five. For example, place three pillar candles of alternating heights together on one side of a buffet and a bowl of ornaments, a lamp and a smaller candle on the other side. Creating holiday themes doesn’t take much doing, either, especially if you already have a definite decorating style (as you can tell my style is very eclectic). If you have a formal traditional style, then by all means go for the gold (or red and green). If you have a natural, earthy style, grab those twigs and bundle them together with some Christmas plaid ribbon or red and green raffia. Modern styles lend themselves well to lime green and red or silver and light blue. And, don't forget get the glitter! Under the snow, that is. Well, we had a crazy snowstorm that dumped 21 inches on our fair city. Needless to say, all plans are on hold until further notice. We had a blast sledding and just walking through this winter wonderland! Mother Nature provided us with the ultimate outdoor Christmas decoration!!! We are busy making cookies, playing in the snow, and we even made a gingerbread house (from a kit) yesterday. It was a kit that I bought last year after Christmas...I think it cost me about $3.00. Since they aren't edible, the house kits keep very well in their packaging, so this year, think about grabbing one for next year! It certainly gave us something to do when the blizzard (and it was a blizzard) was blowing in at full force. My youngest and his two buddies did the majority of the decorating (I was delegated to construction). We used the candy in the kit and some stuff we had around the house. As you can see, it turned out to be really "sweet." I'll post my "Creating Christmas Vignettes" blog tomorrow (I was going to post today, but I just had to share my snowy news). First, how about that Christmas sheet music? You know, the stuff in the piano bench that you swore you were going to learn this Christmas! Make some copies of the music and stuff the originals back in the bench (hey, there’s always next year). Now, grab some red and green ribbon and get wrappin’! Cloth Christmas napkins and tea towels can make artful gift wrap when gathered at the top. Or purchase a pretty scarf and wrap the box in it -- tying the four corners knapsack-style. Your special recipient will love getting two gifts! Cardboard paper towel tubes can serve as easy "boxes" for soft goods such as tee shirt or set of cloth napkins rolled up inside the tube. Wrap it in tissue paper, tie small strands of ribbon on the ends. 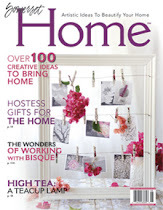 Use white paper as a base for stamping, painting and gluing on decorative ribbons, rickrack and trims. Use a holiday rubber stamp and let your kids help stamp out a fun and personal gift wrap. Or have the kids paint or draw colorful pictures or patterns – a great project on days too cold to venture outdoors. An ornament attached with a color-coordinated ribbon or raffia to secure it to the top of the package is a bonus gift. 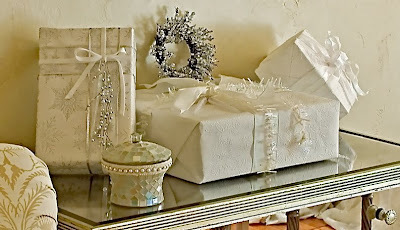 Garland added or used instead of ribbon can add a very elegant touch to your presents (see photo above). Tulle offers a whimsical and soft touch to any package. Pair it with ribbon or use it by itself. Sprigs of pine, holly or magnolia, used in combination with brown paper and raffia, offer a very, earthy natural look. Cinnamon sticks gathered with a rubber band and then tied on the package top with gingham ribbon (make sure you hide the rubber band) conveys a cozy, country look. Jingle bells attached to a present are a very merry way to say, "you're special." Cookie cutters can add just the right spice to your present. Shoelaces in festive holiday colors or patterns can double as ribbon and a gift! Have you any great Christmas wrap ideas? I promised more holiday ideas, right? Well, here you go...you can add a new flair to your decorating this year just by repurposing. After all, is it a written law that you can only hang ornaments on trees? You’ll find ornaments everywhere in my house – in bowls, on doorknobs, on railings, in my window boxes (see above), on lamps, on window latches, on drawer pulls, and of course, on my trees. Group ornaments in a bowl or on a swag of greenery for an elegant holiday centerpiece. Speaking of centerpieces, one beautiful (and easy) holiday centerpiece is to pack a clear glass vase or bowl with fresh cranberries; then add water and flowers. Flank the centerpiece with several medium-sized cocktail glasses filled with cranberries and candles tucked in the centers. Then sprinkle red, silver, and gold ball ornaments in between...dazzling! I also use beaded and crystal garlands in unexpected places – I drape them over lamps, chandeliers and window frames (see picture above) and use them to add a little sparkle to my wrapped presents and greenery. I even threw a decorative candle ring (is that the name of it?) in a crystal bowl and placed plastic utensils in for my party…it looked very pretty (see picture on right). So, now you'll be able to see new possibilities when you open that box (or in my case, several boxes) of Christmas decorations. We had a great neighborhood, progressive holiday party last night. It started at my house with the appetizers, so of course, I cleaned and decorated like a maniac all day. It didn't help that our crooked Christmas tree fell over on Friday and we couldn't get it to stay up. So we did the logical thing and returned it! (Hey, if you pay that much for a live tree, you don't want lean it against a wall or cut three feet off the bottom just to get it to stand up.) My husband came home with a beautiful 10-foot tree late Friday and of course, we had to wait for the branches to fall in order to string the lights. So, at 3 PM in the afternoon (the party started at 6:30 PM), we had an undecorated tree, dirty, muddy floors, pine needles, boxes and ornaments strewn everywhere, and only half the downstairs cleaned. With my husband's help, we opened our doors at 6:30 on the dot, showered and dressed with a perfectly decorated tree and a clean house (I just had to tackle anyone who tried to use the upstair's bathroom). For example, my friend, Mary, dropped off bundles of magnolia leaves (thanks Mary!) and it took me about 10 minutes to create simple, but elegant swags for my indoor windows ( I have no money for art, so my walls are decorated with old salvaged windows, rusty, iron fences and a screen door frame). I just clipped a few of the branches, secured them with floral wire and tied festive ribbon (that I picked up at Michael's for 80% off last year). Next blog...more ideas! It looks like the Christmas spirit hasn't hit everyone this year. After many parking lot battles, dealing with line jumping jockeys and seeing that dreadful SOLD OUT sign at toy stores, I can say that I am glad to be safe and sound back in my cozy house. I just finished decorating the kitchen (yes, I decorate every room…except the upstairs’ bathrooms) and I must say that I love my snowflake windows. My third grader and I spent some quality time cutting out these little gems and I also cut some on the way home from NYC. I even brought extra scissors in case my friends wanted to join me in snipping snowflakes – no one wanted to – scrooges! The best instructions that I’ve found to make paper snowflakes comes from – I hate to say it – but Martha Stewart. 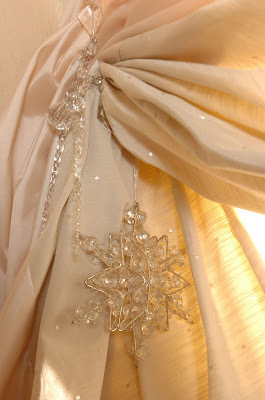 Check them out at http://food.yahoo.com/articles/martha-stewart/channel181245/paper-snowflakes and you’ll love how they turn out! There's nothing like going to New York City for some Christmas inspiration. The windows were beautiful (and so was the weather) and the city was buzzing with seasonal anticipation. Although, I can't recreate the windows, I can share with you a couple easy tips to add some delightful details to your home. If you have the time (even if you don't), you can easily find little spots to add some Christmas charm. For example, suspend a sparkling ornament from your chandelier or drape some glittery garland around it. Dangle an ornament from all of your doorknobs – you can even use those dollar store icicles and string them across your valances or use them as your curtain tiebacks. My fan pull even has a little ornament swinging from it! These are easy ways to add Christmas charm to your home without expense or a lot of work. Just grab a handful of those ornaments that don’t quite fit on the tree and walk around your house adorning everything that you can and pretty soon your house will be sparkling with magical merriment. Tis the Season to Use Spray Paint! Spray paint is your friend. It can transform anything into a gilded Christmas treasure, a shimmering silver or snow-white sensation. Case in point: yesterday, while walking my dog, I found dozens of acorns and pinecones on the roadside. Tucking them away in my pockets (and the bag reserved for doggie you-know-what) I carried them home and promptly set them in the garage. This weekend, I’ll venture out for some unusual twig formations, gather a few of my dented and scratched up ornaments and lay all of them on some newspaper. I will grab my handy can of white flat spray paint and spray away…instantly transforming them all into winter-white accessories for my home. You can spray paint just about anything and make it look great and very “Christmassy.” See what a can of gold or silver can do! Go wild and try some red and green glossy paint; and repeat after me: "spray paint is my friend; spray paint is my friend..."
Note: for safety’s sake, be sure to use your spray paint in a well-ventilated area (preferably outside). I usually wear safety glasses to protect my eyes from the spray, too. If it’s windy, stay far away from your cars, objects or home (unless of course, you want them to have a nice coat of “frost” on them). Okay, I admit it. This blog thing can be tough if you are REALLY busy. Thank goodness I have been busy with writing, vacationing and the kids. My goal once the kids start school? Paint more furniture and write on this blog at least once a week!! My garage is literally overflowing with pieces to paint.